A UCF engineering has created a wheel anti-theft device and app to stop recent criminal car thefts on and around campus. A UCF student hopes to stop tire-stealing criminals in their tracks with his latest invention: an app that notifies owners when their car wheels have been stolen. 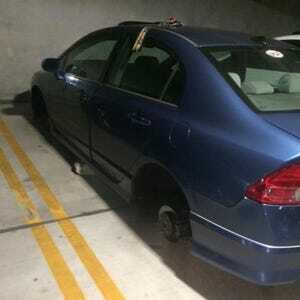 Car tire thefts are not something new to the UCF area. Just from 2015 and 2016, UCF Police Department spokeswoman Courtney Gilmartin said UCFPD has seen a total of five reports related to vehicle tire theft or tire tampering since 2015. There were 15 reports of stolen vehicles, such as cars, golf carts and motorcycles. These reports don’t include non-student housing thefts outside of UCF such as Tivoli Apartments, where three cars had all four tires stolen in March. Matt White, a junior electrical engineering major who’s worked on cars, has noticed these trending thefts since he started UCF in fall 2014. White decided the best solution would be to notify whoever had their wheels stolen and then track the wheels’ location in real time using Google Maps. So he plans to create an app that would do just that. White calls this device TrakSURE. “The best way to describe it would be a cellphone inside of your wheel,” White said. The device wouldn’t be very visible, but if the thief removed the sensor from the bottom of the car, the module, or brain of the system, would see an opening in the circuit and would send the owner a notification that someone is tampering with the system. White plans to have an app alert customers immediately, even if the phone is on silent. White aims to have the notification be sent to the car owner or cops directly, but is still in the process of perfecting that feature. Although White had this idea years ago, he didn’t start working on it until November 2015. He has received help from another state college and his mentor Oscar Rodriguez, of the UCF College of Engineering & Computer Science and the I-Corps teaching team, a program that helps innovators bring their products to market. White said he wants to make the app, module and sensor affordable to UCF students by selling it for under $100; however, this will not include the interactive Google Maps. If customers want it to include the tracking, it will be more expensive and may have a monthly or yearly fee associated with it. White said he will have a demo of the device ready for a Georgia car show in May.